Background: Elderly patients with diabetes receiving social support are likely to have better compliance with their disease self-care. However, no previous study from Turkey has assessed the effect of social support on diabetes burden among elderly patients. Objective: The objective of this study was to assess the association between social support and disease burden among elderly patients with diabetes in Turkey. Materials and Methods: This cross-sectional study included 271 randomly selected elderly patients with diabetes who presented to the internal medicine and diabetes polyclinics of three state hospitals (Sindirgi State Hospital, Balikesir Ataturk State Hospital and Balikesir State Hospital) in Balikesir, Turkey, between April and November 2017. A single interviewer collected all data using a sociodemographic form, the Elderly Diabetes Burden Scale (EDBS) and the Multidimensional Scale of Perceived Social Support (MSPSS). Data were analyzed using arithmetic averages, percentages and Pearson's correlation. Results: The mean age of the participants was 72 ± 5.2 (65–88) years, and most (53.6%) were females and lived with their family: spouse (58.3%), children (18.5%) or both (17.7%). The mean EDBS score was 35.21 ± 6.94 (25–69), and the mean MSPSS score was 67.81 ± 17.33 (12–112). A significant negative correlation was found between the mean total of both assessment tools (P < 0.05), indicating diabetes burden was higher among those with lower social support. A similar significant correlation was observed between symptom burden, social burden, burden of dietary restrictions, burden by tablets or insulin and the total EDBS score. Conclusion: This study found that in Balikesir, Turkey, social support for elderly patients with diabetes was mostly provided by their families and that their diabetes burden decreased with increased social support levels. Diabetes is a global epidemic affecting about 422 million people worldwide. Between 1980 and 2014, global prevalence among adults aged ≥18 years increased from 4.7% to 8.5%. In the Middle East, economic development and a consequent adoption of Western lifestyle have caused a rapid increase in diabetes, resulting in Saudi Arabia (23.9%), Kuwait (23.1%) and Qatar (22.9%) being among the top ten countries in the world with regard to prevalence of diabetes mellitus in the population aged 20–79 years. In recent years, the use of “social support” has received greater attention in diabetes care; formal and informal individualized attention to meet complex diabetes self-care regimens, such as social support, can have a significantly positive role in adherence to self-care.,, The importance of social support in diabetes management has been recognized among elderly., Studies have shown that elderly patients with diabetes who receive social support from family members and friends are likely to have better compliance with diabetic self-care activities, and thus have improved clinical outcomes.,, Moreover, social support can also have a significant effect in improving diabetes-specific quality of life and well-being among elderly patients with diabetes.,,, However, only few studies have been conducted investigating the association between social support and diabetes burden in elderly patients with diabetes,, and to the best of our knowledge, no such study has been conducted in Turkey. Therefore, the aim of this study was to assess the association between social support and disease burden among elderly patients with diabetes in Turkey. This cross-sectional survey included elderly patients with diabetes who presented to the internal medicine and diabetes polyclinics of three state hospitals (Sindirgi State Hospital, Balikesir Ataturk State Hospital, and Balikesir State Hospital) situated in Balikesir, Turkey, between April and November 2017. The sample size of the research was calculated using Epi Info version 6 (CDC, Atlanta, GA, USA). According to the diabetes program of Turkey (2015–2020), the prevalence of diabetes among the elderly population is 32%. Odds ratio was used to determine the strength of association and was reported with 95% confidence interval, 5% deviation and 32% prevalence. From these, the minimum required sample size with a 95% confidence interval was calculated to be 271, and the maximum sample size was 680. During the study, about 1400 elderly patients with diabetes presented to the three hospitals. Of these, through simple random sampling, 271 patients who agreed to participate were included in this study. The inclusion criteria were as follows: aged ≥65 years, a confirmed diagnosis of diabetes, no eyesight and hearing problems, able to establish verbal communications and a score of ≥24 points on the Mini-Mental Status examination (MMSE). MMSE is a tool for systematically and thoroughly grading the mental state of patients. It comprises 11 questions that test five areas of cognitive function: orientation, registration, attention and calculation, recall and language. The maximum score is 30, and a score of ≤23 is indicative of cognitive impairment. As MMSE takes only 5–10 min to administer, it is practical for repeated and routine use. For this study, the authors used the Turkish version of MMSE, which has been shown to high reliability and validity for the diagnosis of mild dementia in the Turkish population. Data were collected by the first author through face-to-face interviews using a sociodemographic form, the elderly diabetes burden scale (EDBS) and the Multidimensional Scale of Perceived Social Support (MSPSS). Each interview took approximately 30 min. The sociodemographic form elicited personal information such as age, gender, medical history, type of diabetes mellitus, duration and complication of diabetes mellitus. EDBS is a 22-item, four-point multiple choice scale comprising six subscales: symptom burden (4 items), social burden (5 items), burden from dietary restrictions (4 items), anxiety about diabetes (4 items), treatment dissatisfaction (2 items) and burden by tablets or insulin (3 items). In this scale, higher scores indicate a stronger level of diabetic burden., The Turkish version of the EDBS was tested by Usta-Yıldırım and Esen, who found the internal consistency (Cronbach' alpha) to be 0.92. MSPSS is a 12-item tool to assess social support and comprises three subscales: family, friends and significant other. Each subscale includes four items, and each item is rated on a 7-point Likert-type scale, where 1 = very strongly disagree and 7 = very strongly agree, and thus higher overall scores indicate a better level of social support. The Turkish version of the MSPSS was tested by Eker et al., who found the internal consistency (Cronbach' alpha) to be 0.89. Data were analyzed using SPSS version 15.0 (SPSS Inc., Chicago, IL, USA). Sociodemographic characteristics and scores of scales were examined using arithmetic averages, percentages and standard deviation. Pearson's correlation analysis was used to examine the association between EDBS and MSPSS variables. P < 0.05 was considered statistically significant. The study was conducted after obtaining approval from the Research Ethics Committee of Manisa Celal Bayar University, Manisa, Turkey (Ref. no. : 21/12/2016/20.478.486-417). Participants were informed about the study's purpose, procedural details, their right and potential benefits and risks of the study. All participants were only included after they provided written consent forms. The mean age of the participants was 72 ± 5.2 years (age range: 65–88 years), and the majority were women (53.9%). 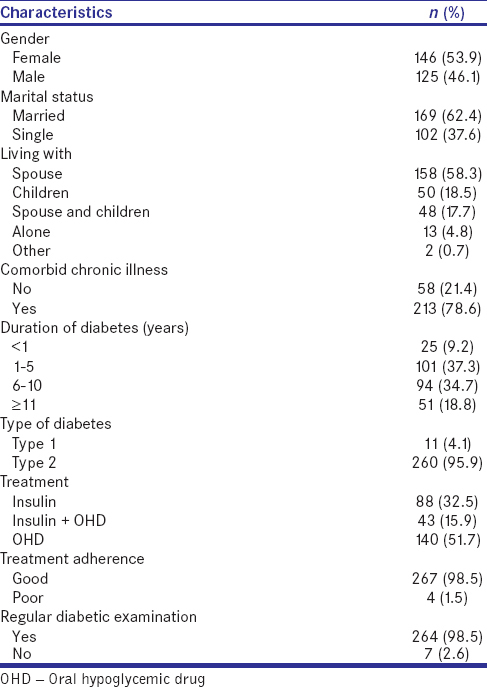 Of the 271 elderly patients with diabetes who were interviewed, 95.9% had type II diabetes, and 37.3% had a mean diabetes duration of 1–5 years. Further, 32.5% of the participants had been under insulin treatment. [Table 1] shows sociodemographic and diabetes characteristics of the participants. For social support, most participants had family members: spouse (58.3%), children (18.5%) or both spouse and children (17.7%). [Table 2] shows the metabolic control parameters; 82.3% of participants had a mean HbA1c ≥8% and 50.6% had retinopathy. The mean score of EDBS was 35.21 ± 6.94 (25–69); [Table 3] shows the mean scores of all six subscales. For MSPSS, the mean score was 67.81 ± 17.33 (12–84); [Table 4] summarizes the mean scores for each subscale. 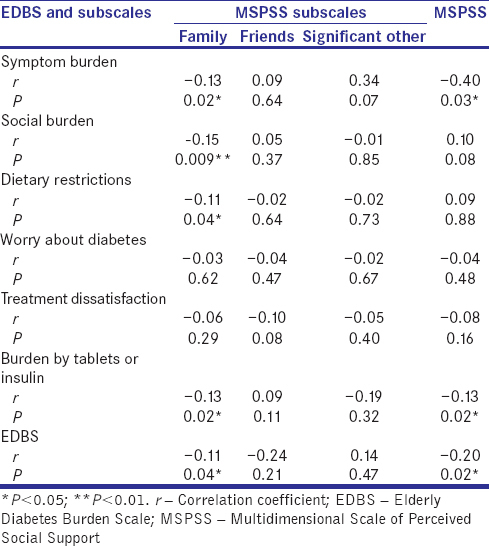 A significant negative correlation was found between the mean total EDBS and MSPSS scores (P < 0.05) [Table 5], indicating that diabetes burden was higher among those with lower social support. Further, there was a significantly negative correlation between symptom burden (P < 0.05), social burden (P < 0.01), burden of dietary restrictions (P < 0.05), burden by tablets or insulin (P < 0.01), total EDBS score (P < 0.05) and family subscale, indicating that the impact of burden is reduced and restrictions decrease with a better level of family support. A significantly negative correlation was also found between symptom burden (P < 0.05), burden by tablets or insulin (P < 0.05) and total MSPSS score, indicating that these factors are affected by the level of social support, wherein better social support results in lower levels of burden [Table 5]. Age-related increase in diabetes and its complications have been noted in several studies.,,, Elderly patients receiving social support are more likely to have better compliance with diabetic self-care activities, and consequently, improved clinical outcomes.,, However, despite Turkey having both an aging population and a growing rate of diabetes,,, there were no studies from here assessing the effect of social support on diabetes burden among elderly patients with diabetes. Accordingly, the current study found that in Turkey, diabetes burden among elderly patients decreased with increased levels of social support, and the main source of social support was families. A major limitation of this study was that it only included elderly patients with diabetes from three hospitals in Balıkesir, Turkey, and thus its results may not be generalizable to all elderly patients with diabetes in Turkey. This study found that in Balıkesir, Turkey, the main source of social support among elderly patients with diabetes was their family, especially spouse. Further, the diabetes burden of these patients decreased with increased levels of social support. The authors recommend that for elderly patients with diabetes, health-care professionals should include family members in the health education sessions and provide them with more information regarding metabolic control and self-care activities, which would likely improve the level and quality of social support these patients receive. The authors would like to thank the elderly patients who participated in the study as well their caregivers. World Health Organization. Diabetes. World Health Organization. Available from: https://www.who.int/news-room/fact-sheets/detail/diabetes. [Last accessed on 2019 Mar 06]. Naeem Z. Burden of diabetes mellitus in Saudi Arabia. Int J Health Sci (Qassim) 2015;9:V-VI. Charvat H, Goto A, Goto M, Inoue M, Heianza Y, Arase Y, et al. Impact of population aging on trends in diabetes prevalence: A meta-regression analysis of 160,000 Japanese adults. J Diabetes Investig 2015;6:533-42. Tekin CS, Kara F. Aging in the World and Turkey. J Int Sci Res 2018;3:219-29. Çivi S, Tanrıkulu Z. An epidemiological study to evaluate the level of dependence and physical disability with the prevalance of chronic diseases in the elderly. Turk J Geriatr 2000;3:85-90. Satman I, Omer B, Tutuncu Y, Kalaca S, Gedik S, Dinccag N, et al. Twelve-year trends in the prevalence and risk factors of diabetes and prediabetes in Turkish adults. Eur J Epidemiol 2013;28:169-80. T.C. Saǧlık Bakanlıǧı Türkiye Halk Saǧlıǧı Kurumu. Türkiye Diyabet Program; 2015-2020. Available from: https://www.extranet.who.int/ncdccs/Data/TUR_D1_T%C3%BCrkiye%20Diyabet%20Program%C4%B1%202015-2020.pdf. [Last accessed on 2019 Mar 22]. Araki A, İto H. Development of elderly diabetes burden scale for elderly patients with diabetes mellitus. Geriatr Gerontol Int 2003;3:212-24. Fagot-Campagna A, Bourdel-Marchasson I, Simon D. Burden of diabetes in an aging population: Prevalence, incidence, mortality, characteristics and quality of care. Diabetes Metab 2005;31:5S35-52. Ramkisson S, Pillay BJ, Sibanda W. Social support and coping in adults with type 2 diabetes. Afr J Prim Health Care Fam Med 2017;9:e1-8. Shao Y, Liang L, Shi L, Wan C, Yu S. The effect of social support on glycemic control in patients with type 2 diabetes mellitus: The mediating roles of self-efficacy and adherence. J Diabetes Res 2017;2017:2804178. Vaccaro AJ, Exebio CJ, Zarini GG, Huffman GF. The role of family/friend social support in diabetes self-management for minorities with type 2 diabetes. World J Nutr Health 2014;2:1-9. Harvey SI, Sherman L, Spears E, Ford C, Green HD. Social support and diabetes self-management behavior among Caribbean, Caribbean American, and African American women: A descriptive correlation study. J Soc Health Diabetes 2017;22:16-24. Mendoza-Núñez VM, Flores-Bello C, Correa-Muñoz E, Retana-U Galde R, Ruiz-Ramos M. Relationship between social support networks and diabetes control and its impact on the quality of life in older community-dwelling Mexicans. Nutr Hosp 2016;33:1312-6. Mondesir FL, White K, Liese AD, McLain AC. Gender, illness-related diabetes social support, and glycemic control among middle-aged and older adults. J Gerontol B Psychol Sci Soc Sci 2016;71:1081-8. Mendoza-Núñez VM, González-Mantilla F, Correa-Muñoz E, Retana-Ugalde R. Relationship between social support networks and physical functioning in older community-dwelling Mexicans. Int J Environ Res Public Health 2017;14. pii: E993. Ahmad Sharoni SK, Shdaifat EA, Mohd Abd Majid HA, Shohor NA, Ahmad F, Zakaria Z. Social support and self-care activities among the elderly patients with diabetes in Kelantan. Malays Fam Physician 2015;10:34-43. Baek RN, Tanenbaum ML, Gonzalez JS. Diabetes burden and diabetes distress: The buffering effect of social support. Ann Behav Med 2014;48:145-55. Bowen PG, Clay OJ, Lee LT, Vice J, Ovalle F, Crowe M. Associations of social support and self-efficacy with quality of life in older adults with diabetes. J Gerontol Nurs 2015;41:21-9. Dean AG, Sullivan KM, Soe MM. OpenEpi: Open Source Epidemiologic Statistics for Public Health, Version. Available from: http://www. OpenEpi.com. [Last accessed on 2019 Mar 14; Last updated on 2013 Apr 06]. Folstein MF, Folstein SE, McHugh PR. “Mini-mental state”. A practical method for grading the cognitive state of patients for the clinician. J Psychiatr Res 1975;12:189-98. Güngen C, Ertan T, Eker E, Yaşar R, Engin F. Reliability and validity of The Standardized Mini Mental State Examination in the diagnosis of mild dementia in Turkish population [Article in Turkish]. Turk Psikiyatri Derg 2002;13:273-8. Zimet GD, Dahlem NW, Zimet SG, Farley GK. The multidimensional scale of perceived social support. J Pers Assess 1988;52:30-41. Usta-Yıldırım Y, Esen A. A study of the validity and reliability of the elderly diabetes burden scale for the Turkish society. Turk J Geriatr 2012;15:61-7. Eker D, Arkar H, Yaldız H. Factorial structure, validity, and reliability of revised form of the multidimensional scale of perceived social support. Turk Psikiyatri Derg 2001;12:17-25. Savsar A, Çürük NG. The Effect of Health Beliefs of Elderly Diabetic Foot Patients on Diabetes Burden. Antalya Turkey: 1st International Internal Medicine Nursing Congress; 25-27 November, 2018. Can Çiçek S, Yıldırım Usta Y, Doǧanyiǧit D, Ankaralı H. Diabetes Burden and Related Factors in the Elderly with Diabetes. Antalya Turkey: 1st International Internal Medicine Nursing Congress; 25-27 November, 2018. Ovayolu Ö, Ovayolu N, Doǧru A, Özkaya M. The challenge of diabetes in the elderly and affecting factors: A Turkish study. Holist Nurs Pract 2015;29:272-9. Selvin E, Coresh J, Brancati FL. The burden and treatment of diabetes in elderly individuals in the U.S. Diabetes Care 2006;29:2415-9. Sudore RL, Karter AJ, Huang ES, Moffet HH, Laiteerapong N, Schenker Y, et al. Symptom burden of adults with type 2 diabetes across the disease course: Diabetes and aging study. J Gen Intern Med 2012;27:1674-81. Debnam K, Holt C, Clark E, Roth D, Southward P. Relationship between religious social support and general social support with health behaviors in a national sample of African Americans. J Behav Med 2012;35:179-89. Uchino BN. Understanding the links between social support and physical health: A Life-span perspective with emphasis on the separability of perceived and received support. Perspect Psychol Sci 2009;4:236-55. Strom JL, Egede LE. The impact of social support on outcomes in adult patients with type 2 diabetes: A systematic review. Curr Diab Rep 2012;12:769-81. Koetsenruijter J, van Eikelenboom N, van Lieshout J, Vassilev I, Lionis C, Todorova E, et al. Social support and self-management capabilities in diabetes patients: An international observational study. Patient Educ Couns 2016;99:638-43. White AM, Philogene GS, Fine L, Sinha S. Social support and self-reported health status of older adults in the United States. Am J Public Health 2009;99:1872-8. Bøen H, Dalgard OS, Bjertness E. The importance of social support in the associations between psychological distress and somatic health problems and socio-economic factors among older adults living at home: A cross sectional study. BMC Geriatr 2012;12:27. Tang TS, Brown MB, Funnell MM, Anderson RM. Social support, quality of life, and self-care behaviors among African Americans with type 2 diabetes. Diabetes Educ 2008;34:266-76. Aksüllü N, Doǧan S. Relationship of social support and depression in institutionalized and non-institutionalized elderly. J Anatol Psychiatry 2004;5:76-84. Softa-Kaçan Y, Bayraktar T, Uǧuz C. Elders' perceived social support systems and factors effecting their healthy life-style behavior. Elderly Issues Res J 2016;9 (1):1-12. McNicholas SL. Social support and positive health practices. West J Nurs Res 2002;24:772-87. Taş A, Bayraktar MZ, Erdem Ü, Sobacı G, Uçar M. Prevalence and risk factors of retinopathy in patients with diabetes mellitus. Gulhane Med J 2005;47:164-74. Gülcan E, Ozcura F, Aydın S, Erbilen E, Koral L. The frequency of diabetic retinopathy and relevant factors for prediabetic subjects. Gulhane Med J 2008;23:122-5. Önmez A. Management of microvascular complications in diabetes mellitus. J Dent Univ Health Sci Inst 2017;7:117-9.